Travel theme: Big | Where's my backpack? My recent visit to the extremely large and slightly menacing Fremont Troll got me thinking about other big sights I’ve encountered on my travels. 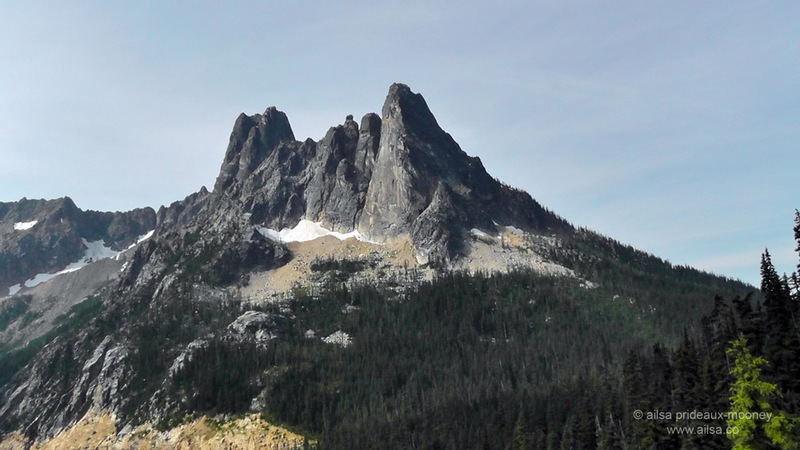 Journeying along Washington State’s North Cascades Highway, Liberty Bell Mountain will stop you in your tracks with its scale and beauty. I can still hear the whirring of the white windmills covering Tehachapi Pass; the biggest wind farm I’ve ever seen. After driving through the desert and reaching Las Vegas just as night fell, it was pretty startling to see a fifty foot tall Gordon Ramsay glaring at us from the side of a mini Arc de Triomphe. But the one sight that will remain emblazoned upon my mind’s eye forever is my very first sight of Montana‘s big skies. Looking forward to seeing the big picture or pictures you come up with for this week’s challenge. This entry was posted in Photography, Travel, Weekly Travel Themes and tagged inspiration, nature, photography, photos, pictures, postaday, travel, writing. Bookmark the permalink. Love it – I’ll get right on it!! It certainly was! I was so impressed! Hmm… What I allow to annoy me. Good thought. I’ll work on being bigger than I am. Yes, that quote really made me stop and think, Trish. A big monument nearby; the Phra Pathom Chedi, the modern legacy of the first Buddhist people in South East Asia. Said to be the biggest stupa in the world. Ooh, that’s wonderful, Ben, it makes me think of a great big beehive! This will be fun. I bet I come across something that fits the theme in my travels today! Excellent, here’s wishing you big adventures today, Anne! !That quote at the end is really good! Great post! This is an inspiring theme! Love these shots, the Liberty Bell Mountain is majestic! No, you are correct about that! But the board and the view compensates,me thinks. Oh and what he’s about to do. Love the quote. Food for thought! Thanks Jennifer, yes, me too, it made me stop and think! This was a big challenge. Literally. So many great ideas. Settled on this. Those wind farms are awful, an eyesore on the landscape. I can’t imagine how awful it must be to live in the vicinity of one of those farms. Yikes, it must be pretty scary being in a kayak when something that big cruises by! For once I took your challegen literally. . .
Big *hugs* Big – YES, you gave me the perfect opportunity to post a photo of something I admire with all of my heart. Thanks for giving us an example each week, I love your photography. Have a lovely and big weekend. Inspiring as usual! Demands some thinking…your photos are chosen from inspiringly different angles, so to speak…I’ll be back! Thank you for hosting the Wekkly Travel theme! It will be a few days before I have time to post my entry but I just wanted to say…Mountains were my first thought, I’ll see what I can come up with. And those windmills…how close did you get? I drove by a windmill farm in Indiana last week (yeah, Indiana, who would have thought), I was able to be about 50 feet from them. WOW, they are huge!! The Bon Jovi car is amazing! Pingback: Big? Big trouble! Ailsa’s WTT | Ouch!! My back hurts!! How about the BIG city for a small town girl? See my BIG city adventure here. From an army of windmills to Gordon Ramsey…hmm….Quixotic, what? Love the road to the big blue yonder.